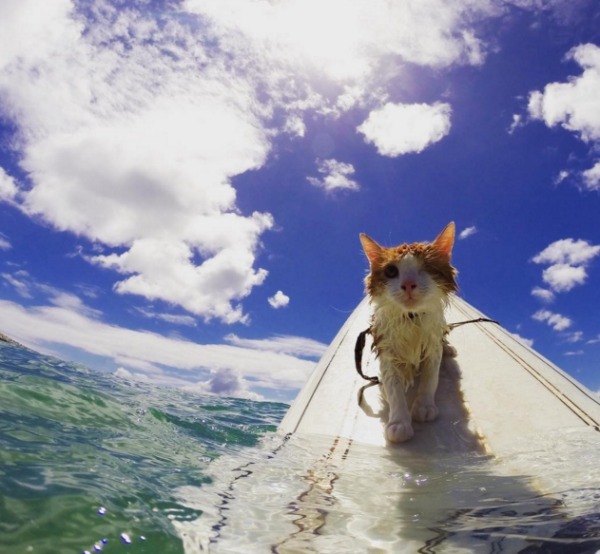 Cat lovers who are heading to Hawaii should put the beach of Honolulu on their list of places to visit because this is the only part of the world where you can watch a one-eyed ginger cat perform tricks on a surfboard. 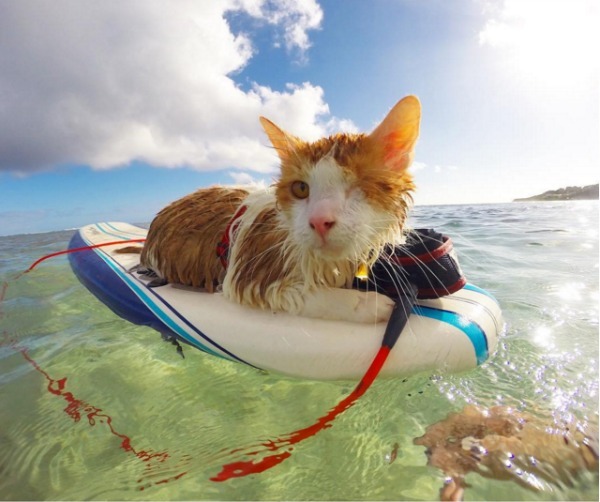 The one-eyed surfing cat is called Kuli. He was rescued from the streets as a tiny, malnourished kitten and began training and surfing when he was only six months old. 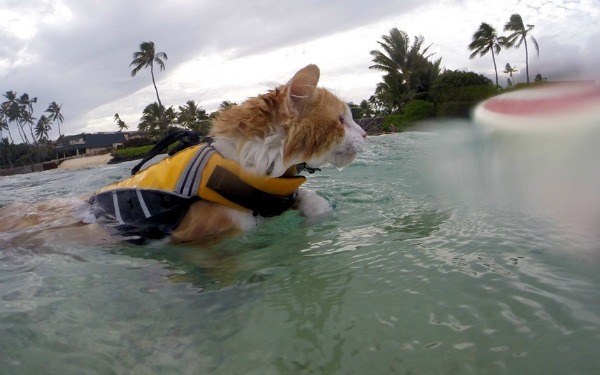 He now loves to go swimming and surfing with his humans in the blue-green waters of Honolulu, Hawaii. P.S. Have you seen the skateboarding cat of Coolangatta? How amazing that Kuli likes to go swimming and surfing - we don't even like rain! Wow, what a brave cat! This is one brave kitty! 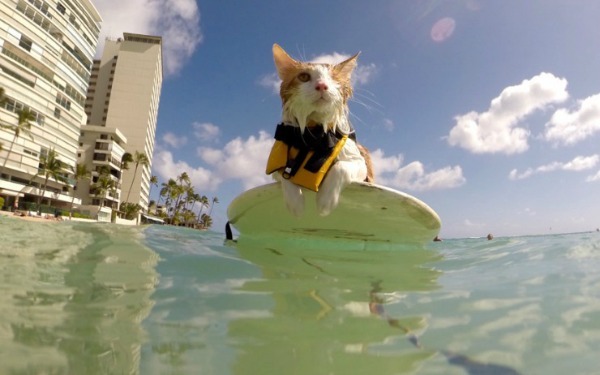 I had never heard of a surfing cat. Wow, what a cool kitty cat. My cat would never tolerate that. That cat has a sense of adventure. Kuli is a brave and adventurous kitty! Oh! He's so great looking on these photos. Looks like he's having fun surfing! He's really cool cat! How adorable! He looks like he's really enjoying himself, too. How cool! 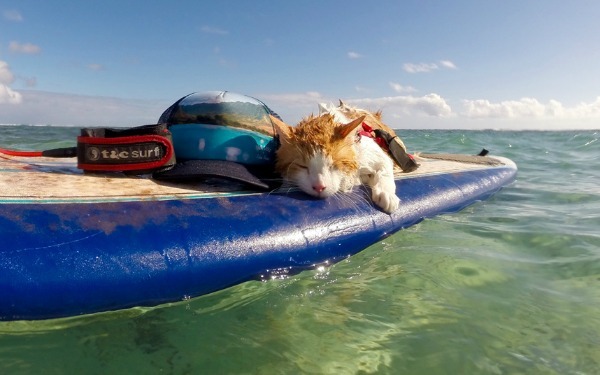 I haven't see a surfing cat before. I am even amazed he likes water. How cool! Our kitteh used to like to getting in the shower with me in the mornings but as she has gotten older, not so much LOL! Thanks for sharing with us at Photo Friday! Wonderful cat acttivities even though she has only 1 eye. Have a great weekend. 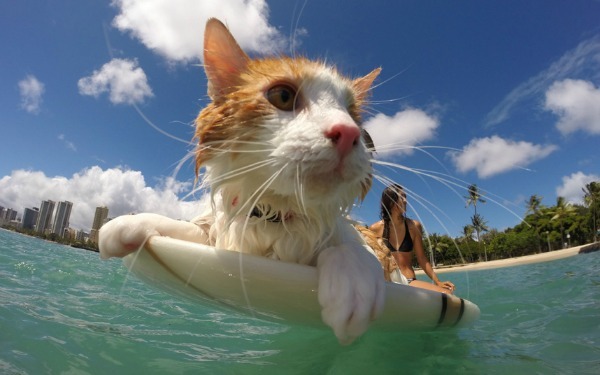 Oh wow, a surfing kitty. Very cute photos. Thank you for linking up and sharing your post. Have a happy weekend! WOW. Kuli is so cool. Thanks for sharing about him! That is quite something! I thought it was a big deal when I taught my cat to "shake" and "high five," but surfing is amazing. Thanks for sharing at My Flagstaff Home! This is amazing! 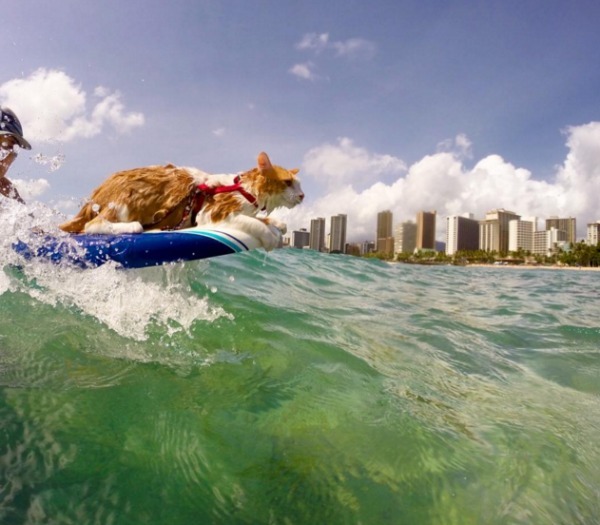 A cat swimming and surfing, difficult to imagine it if not seeing it. 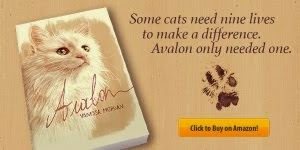 What amazing photos of such a special kitty! Just passing through while looking for a grain free cat food recipe and I thought I would comment. If you are not adding a cat vitamin to this mix your cat is in danger of some deficiency-related illnesses. Homemade cat food is great, but what you are cooking here does not meet their nutritional requirements. 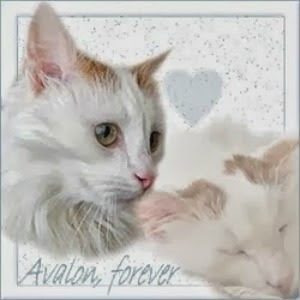 Best Dry Cat Food - Here's a link where you can read about it. Awwww, love you Kuli!!!! Very proud of him! These cat pictures are truly adorable!